To be sure, loan growth is unlikely to get back to the heyday of the last boom, but that may actually be a good thing. A research note by Royal Bank of Scotland Plc (RBS) on “Banks: Light at the end of the tunnel" points out that the return on equity (RoE) for public sector banks is higher than the average for private sector banks, primarily because the latter have raised capital and diluted their equity. But since loan growth is likely to be muted for some time, the higher RoE will act as a cushion and public sector banks may not need to raise capital in a hurry. The second reason is that public sector banks, with their strong deposit growth in the last year, will benefit the most from the repricing of liabilities. Says the RBS note: “The ability of banks in general to pass on the total increase in the cost of funds appears limited. However, as liabilities reprice lower, NIMs (net interest margins) tend to expand. In the short term, we believe NIMs in 2HFY10 (the second half of this fiscal year) will be better than 1HFY10." Since public sector banks suffered the most from the margin squeeze, they will also benefit the most from the margin expansion. What about non-performing assets? Won’t all those restructured loans come home to roost as bad loans on bank balance sheets? The single most important reason that things will not be as bad as expected is that companies have been swift to take advantage of the rise in the capital market to go out and increase their capital. As a bank analyst pointed out, most of the QIPs (qualified institutional placements, or share sales to financial institutions) mentioned repaying debt as one of the objectives of the issue. The consequence: debt-equity ratios have improved. That’s apart from the fact that corporate profits have also improved as the economy recovers. 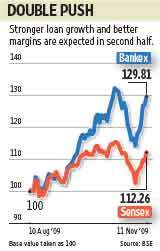 Many public sector bank valuations, too, are in the comfort zone, and some analysts contend that a rotation away from sectors such as telecom is helping the Bankex. Most analysts expect the Reserve Bank of India’s directive for 70% provision to be modified. In any case, its effect will be to strengthen the banks over the longer term. The big risk to public sector bank valuations, though, is the prospect of high government borrowings continuing next fiscal.